BIO-TECHNOLOGY and our CHURCH in Antarctica – W.A.P. The use of bio-technology is more a modern need rather than a nowadays fashion. The project of building a New Church in Antarctica is a proposal launched by WAP back in the year 2003, which unfortunately has not been approved yet by the Italian National Antarctic Dept. called PNRA. 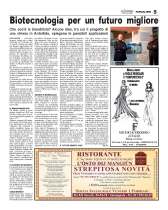 On a local Italian Newspaper (la Pancalera www.lapancalera.it ) in its February 2008 issue, there is an interesting article explaining about the characteristic of this kind of bio-building material, well explained by Ing. Sebastiano Bertero, the man who will donate the building to the Italian Base MZS in Antarctica as soon as the PNRA will accept this donation. The Church will be fully built according to the bio-building techniques. Help us to do it…. It is not an easy task but I’m sure we will accomplish it!